The parallel fibers relay information coming into the cerebellar cortex from the mossy fibers, and they form synapses with molecular layer interneurons (MLIs) and Purkinje cells. Here we show that activation of ionotropic GABA receptors (GABAARs) induces glutamate release from parallel fibers onto both MLIs and Purkinje cells. These GABA-induced EPSCs have kinetics and amplitudes identical to random spontaneous currents (sEPSCs), but, unlike sEPSCs, they occur in bursts of between one and five successive events. The variation in amplitude of events within bursts is significantly less than the variation of all sEPSC amplitudes, suggesting that the bursts result from repetitive activation of single presynaptic fibers. Electron microscopy of immunogold-labeled α-1 subunits revealed GABAARs on parallel fiber terminals. We suggest that the activation of these receptors underlies the increased amplitude of parallel fiber-evoked Purkinje cell EPSCs seen with application of exogenous GABA or after the release of GABA from local interneurons. These results occur only when molecular layer GABAARs are activated, and the effects are abolished when the receptors are blocked by the GABAAR antagonist gabazine (5 μm). From these data, we conclude that GABAARs located on parallel fibers depolarize parallel fiber terminals beyond the threshold for Na+ channel activation and thereby induce glutamate release onto MLIs and Purkinje cells. Recent data demonstrating the influence of subthreshold activity at synaptic terminals (Awatramani et al., 2005; Alle and Geiger, 2006; Shu et al., 2006) has made the subject of presynaptic ionotropic receptors a topic of much interest. This work has shown that small voltage changes at the terminal have substantial effects on transmission at the synapse and therefore indicate that similar changes in voltage induced by presynaptic receptors could have major influences on synaptic signaling and neuronal processing. Many types of receptors have been found on presynaptic membranes of several different cell types and in several different brain regions (MacDermott et al., 1999; Kullmann et al., 2005). Of these receptors, GABAA receptors (GABAARs) are of particular interest because they can be either excitatory or inhibitory depending on several different factors (Alger and Nicoll, 1982; Staley et al., 1995; Chavas and Marty, 2003; Gulledge and Stuart, 2003; Szabadics et al., 2006). GABAARs have been found previously in the brain on axonal membranes of hippocampal granule cells (Ruiz et al., 2003; Jang et al., 2006; Alle and Geiger, 2007), the molecular layer interneurons (MLIs) of the cerebellum (Pouzat and Marty, 1999), cortical pyramidal cells (Szabadics et al., 2006), as well as on nerve terminals of the posterior pituitary (Zhang and Jackson, 1993) and calyx of Held (Turecek and Trussell, 2002). Outside of the brain, GABAARs have also been found on the axonal membranes of neurons in the peripheral nervous system (MacDermott et al., 1999). The reports on the influence of these receptors on excitability are different in these regions and even vary from inhibitory (Ruiz et al., 2003) to excitatory (Nakamura et al., 2007) within the same preparation. In the granule cells of the cerebellum, in which extrasynaptic receptors have been well documented (Farrant and Nusser, 2005; Kullmann et al., 2005), GABAARs have not yet been found outside of the somatodendritic compartment. We report here the presence of GABAARs in the axonal compartment of granule cells, and we suggest that the response of the receptor to exogenous or endogenous GABA induces depolarization of the synaptic terminals. The depolarization is enough to cross the threshold for Na+ channel activation and thereby induce release of glutamate from the synaptic terminals onto postsynaptic targets. Thus, these presynaptic receptors are excitatory and likely regulate transmission through parallel fiber synapses. Wistar rats between postnatal day 13 (P13) and P29 were anesthetized with halothane and decapitated before removal of the cerebellum. Two-hundred-micrometer-thick sagittal or 400-μm-thick coronal slices were made using a Leica (Nussloch, Germany) VT 1000S vibratome while the cerebellum was bathed in an ice-cold artificial CSF (ACSF) that was bubbled with 95% oxygen and 5% carbon dioxide. The ACSF was composed of the following (in mm): 130 NaCl, 2.4 KCl, 1.3 NaH2PO4, 1 MgCl2, 2 CaCl2, 10 glucose, 26 NaHCO3, and 1–3 kynurenic acid. The molecular layer was visualized using an Axioskop microscope (Zeiss, Oberkochen, Germany) equipped with a 63× water immersion objective. Recordings were made at room temperature using an EPC-10 amplifier (HEKA Elektronik, Lambrecht, Germany). During recordings, the slices were perfused with the same ACSF as they were cut in, without kynurenic acid. Unfilamented borosilicate glass pipettes were pulled using a HEKA Elektronik pipette puller and had an open tip resistance of ∼7 MΩ for interneurons and ∼3 MΩ for Purkinje cells when filled with an internal solution containing the following (in mm): 150 K-gluconate, 4.6 MgCl2, 10 K-HEPES, 1 K-EGTA, 0.1 CaCl2, 4 Na-ATP, and 0.4 Na-GTP, pH 7.3. A second slightly larger “puff” pipette was filled with ACSF and supplemented with either 50 μm GABA or 10 μm muscimol. The puff was generated using a pump to regulate the amount of pressure (∼50 millibars) applied to the back of the pipette and was triggered using a voltage pulse. A platinum wire was inserted into a patch pipette that was filled with ACSF and was connected to an Isolated Pulse Stimulator (model 2100; A-M Systems, Carlsborg, WA) that was set to produce constant voltage for 20 μs after each trigger. The pipette was placed in the parallel fibers of the 400-μm-thick coronal slices, and voltage was then varied (∼5–20 V) to produce a single EPSC of ∼300 pA. The voltage was then left unchanged for the duration of the experiment while the stimulator was triggered by a computer. For experiments shown in Figure 8, two stimulation electrodes were positioned on opposite sides of the recorded Purkinje cell. To localize the stimulus, these electrodes were constructed from theta class with opposite poles of the stimulator in each barrel of the pipette. One electrode (electrode A) was used to deliver test pulses before and after the train (stim i and stim ii), whereas the other (electrode B) was used to deliver the train itself (Dittman and Regehr, 1997). A stimulation protocol was performed at the beginning and end of each experiment to verify that fibers stimulated with electrode A were distinct from the fibers stimulated with electrode B. Because parallel fiber synapses show paired-pulse facilitation, we could easily determine whether stimuli evoked from electrode B induced any facilitation in the responses recorded from stimuli evoked from electrode A. The positions of the electrodes were adjusted until no facilitation was produced and therefore indicated that the fibers stimulated by the two different electrodes were distinct populations. Spontaneous EPSCs (sEPSCs) were detected using EVAN (version 1.2; courtesy of Dr. Istvan Mody, University of California, Los Angeles, Los Angeles, CA) or Neuromatic (version 1.91; courtesy of Dr. Jason Rothman, thinkrandom.com), and all analyses were performed in IGOR Pro (version 5.0.3; WaveMetrics, Lake Oswego, OR) except for the fitting of individual EPSC decay times with exponential equations, which was done in EVAN. P18 Sprague Dawley rats were anesthetized with pentobarbital (60 mg/kg body weight) and intracardially perfused with 4% (w/v) paraformaldehyde and 0.1% glutaraldehyde (Polysciences, Warrington, PA) in PBS. After dissection, the cerebellum was kept overnight in 4% paraformaldehyde at 4°C. Transverse vibratome sections (200 μm) of the cerebellum were treated with ammonium chloride (0.13 g/50 ml of PBS) for 30 min at 4°C. After washing in PBS, the samples were gradually dehydrated in methanol and embedded in lowicryl Hm20 (Polysciences) in an AFS Reichert apparatus (Leica, Wien, Austria) after a progressive lowering of temperature. After polymerization under UV light at −45°C during 48 h, pale yellow sections were incubated for 30 min in goat gold conjugates blocking solution (Aurion, Wageningen, The Netherlands). The sections were washed (three times for 5 min each) in an incubation buffer made of PBS with 0.2% bovine serum albumin-c (Aurion). Sections were subsequently incubated overnight at 4°C in the same buffer with an antibody directed against the α1 GABA subunit (Zezula et al., 1991; Nusser et al., 1995). After extensive washes (six times for 5 min each), the sections were incubated 1 h at room temperature in gold-conjugated secondary antibodies against rabbit IgG (1:50; British Biocell International, Cardiff, UK) and then washed (six times for 5 min each) in the incubation buffer and then in PBS (two times), followed by a 5 min fixation in 2% glutaraldehyde in PBS. After a wash of 5 min in PBS and six washes of 2 min in distilled water, sections were counterstained with uranyl acetate and lead citrate for inspection with a Philips Tecnai 12 electron microscope (FEI, Eindhoven, The Netherlands). Using a pressure pipette, we applied 50 μm GABA to parallel fibers in cerebellar slices while monitoring spontaneous activity in MLIs under whole-cell voltage-clamp conditions. 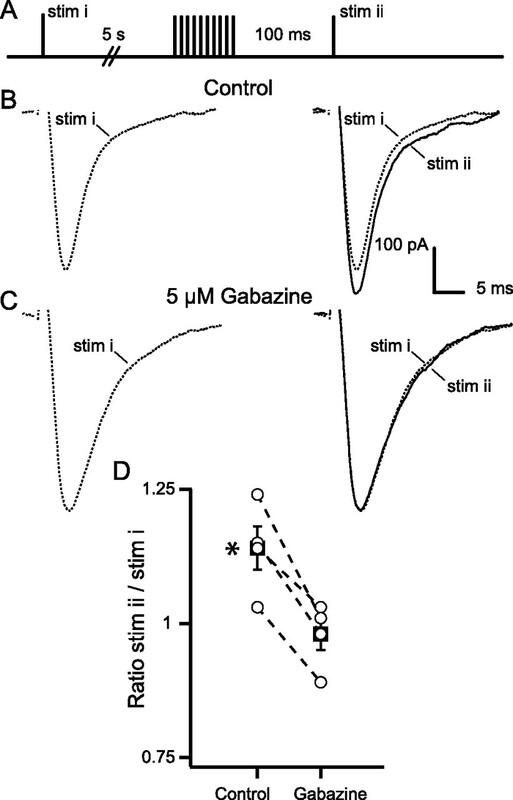 The application of GABA induced a slow outward current in the interneurons as predicted from the holding potential (−60 mV) and the [Cl−]i (10 mm) (Fig. 1A). However, GABA also induced a flurry of fast inward currents that coincided with the onset of the application of the agonist (Fig. 1A; average time course in B). This phenomenon is not an artifact caused by the pressure pipette because it is blocked by the specific GABAAR antagonist gabazine (5 μm). In three of three cells, the antagonist completely blocked both the slow outward current as well as the fast inward currents (Fig. 1C). In two of these three cells, gabazine was washed from the bath and both currents returned (data not shown). GABAAR activation induces EPSCs in MLIs. A, Spontaneous activity recorded in a molecular layer interneuron during the application of 50 μm GABA (black line). The expansion shows the presence of a flurry of fast inward currents recorded during the first seconds of GABA application. B–D, Histograms of the average frequency of inward events recorded during the same time period shown in A, with the black bar signifying the application of either 10 μm muscimol or 50 μm GABA. B, Under control conditions (n = 19 cells). C, In the presence of 5 μm gabazine (n = 3 cells). D, In the presence of 2 μm NBQX (n = 4 cells). To determine whether the effect also requires the activation of GABAB in addition to GABAA receptors, we made recordings in the presence of 1 μm CGP 55845 [2S)-3-[(15)-1-(3,4-dichlorophenyl)ethyl]amino-2-hydroxypropyl)(phenylmethyl)phosphinic acid] and found that the fast inward currents remained (data not shown). The fast inward currents were also induced when GABA was replaced by the highly specific GABAAR agonist muscimol (10 μm) (see Figs. 2, 4, 5). Therefore, the fast inward currents result from the specific activation of GABAARs. In MLIs, IPSCs and EPSCs can be easily distinguished based on the decay kinetics of the two currents. The waveform of the IPSC decay is best fit by a biexponential equation whose fastest time constant is ∼8.7 ms, whereas the decay of EPSCs is best fit by a monoexponential equation with a time constant of ∼1.3 ms (Llano and Gerschenfeld, 1993). The fast inward currents that we elicited when puffing GABA were distinguishable from IPSCs because they were fit by monoexponential equations with time constants <2 ms and were absent when the AMPA receptor antagonist 2,3-dihydroxy-6-nitro-7-sulfamoyl-benzo[f]quinoxaline(NBQX) (2 μm) was washed onto the slice. This concentration of NBQX completely blocked the fast inward currents and had no effect on the slow outward current, indicating that the fast currents were EPSCs originating from brief activations of AMPA receptors (Fig. 1D). GABAAR-induced EPSCs (Fig. 2A) have properties that are nearly identical to spontaneous EPSCs recorded in the same cells under control conditions. The decays were fit by single exponentials with τ values averaging 1.0 ± 0.1 ms compared with 1.3 ± 0.2 ms in control conditions (p > 0.05, paired Student's t test; n = 4) (Fig. 2B) and amplitudes averaging 50.9 ± 6.3 pA compared with 54.5 ± 5.7 pA in control conditions (p > 0.05; n = 4) (Fig. 2B). However, unlike in control conditions, the GABAAR-induced EPSCs appeared in short bursts (Fig. 2A). When the inter-EPSC intervals from data recorded under control conditions are plotted in a histogram, they are fit by a single-exponential equation (τ of 241 ms), whereas two exponentials were required to fit the data collected when muscimol was present (τ1 of 207 ms, τ2 of 19 ms, A1 of 39%, and A2 of 61%) (Fig. 2C). The need for a second exponential indicates that the EPSCs occurred in bursts, and the parameters of the fast component indicate that the average time in between events within the bursts is 19 ms. The burst pattern of Figure 2A, in which the response is clearly composed of several distinct bursts, is incompatible with schemes in which release would occur randomly in a large number of presynaptic fibers. It suggests instead that no more than one fiber was active at any given time and that each active fiber gave rise to a series of EPSCs, either because it fired repetitively or because it remained depolarized for some time (∼200 ms, the duration of a burst). To verify whether the individual bursts which compose the response originated from repetitive activation of the same synapse, we looked at the variability of the amplitudes within bursts and compared them with the variability of all sEPSCs combined, because EPSCs originating from the same synapse are predicted to have similar properties whereas EPSCs from different synapses should show greater variability (Forti et al., 1997; Auger and Marty, 2000). We found that the coefficient of variation of amplitudes recorded during bursts was significantly smaller than the total coefficient of variation from all EPSCs (0.36 ± 0.02 vs 0.61 ± 0.04; p < 0.05, paired Student's t test), consistent with bursts having originated from single synapses. GABAAR activation produces bursts of EPSCs. A, Individual 8 s samples of synaptic activity recorded during four separate applications of muscimol. Note that EPSCs occur in bursts of between one and four events. B, Average decay times and amplitudes of sEPSCs and EPSCs evoked by muscimol. Open circles are individual cells, and black squares are the averages of all the cells. Dashed lines connect data from the same cell. C, Histograms of the average interevent intervals for sEPSCs and EPSCs evoked by muscimol application (n = 4 cells). The histogram of the control events is fit by a monoexponential equation with τ of 241 ms, and the histogram of the events induced by muscimol is fit by a biexponential equation with τ1 of 207 ms (39%) and τ2 of 19 ms (61%). D, Synaptic activity recorded in one cell before (left) and after (right) the bath application of 0.2 μm TTX. The downward deflections are EPSCs. The bars indicate the application of 10 μm muscimol. Spontaneous EPSCs happened to be on average larger than muscimol-evoked EPSCs in these traces, but this was not a general rule. To determine whether repetitive presynaptic firing is part of the mechanism responsible for generating the bursts, we tested for the involvement of Na+ channels. To do this, we repeated the above experiments and washed 0.2 μm TTX onto the slice after inducing the effect under control conditions. In four of four cells, TTX completely abolished the GABAAR-induced EPSCs (Fig. 2D), indicating that the effect requires Na+ channel activation and subsequent firing of presynaptic action potentials. Despite the prolonged presence of the GABAAR agonist (15 s), the overall period of bursting was variable, lasting from ∼0.5 to 5 s (Figs. 1A, 2D), with each individual burst lasting only for a few hundred milliseconds (Fig. 2A). This indicates that GABAAR activation is sufficient to induce the bursting but is not sufficient to maintain it. During activation, GABAA receptors enter desensitized states (Jones and Westbrook, 1995), and this could explain why the increased EPSC frequency is not maintained despite prolonged presence of muscimol. To gain insight into the mechanism responsible for stopping the bursting and perhaps the mechanism responsible for producing it, we determined the amount of time that is required to fully recover the effect between agonist applications. We found that, when compared with using 5 min intervals between applications, repeating the agonist application every 1.5 min either abolished the response altogether or severely attenuated its magnitude (p < 0.05, Student's t test; n = 4) (Fig. 3A,B). However, waiting 10 min between agonist applications showed a trend toward increasing the response without producing a significantly different response than when 5 min intervals were used (p > 0.05, Student's t test; n = 4) (Fig. 3A,B). After long-lasting GABA pulses, GABAARs have been shown to recover from desensitization with time constants on the order of at most ∼13 s (Jones and Westbrook, 1995). Therefore, because the increase in EPSC frequency was not fully recovered after 90 s, GABAAR desensitization is unlikely to provide the entire explanation for its transience. It has been noted in another context that responses to long GABA applications recover more slowly than expected from GABAAR desensitization properties (Segal, 1993). An attractive explanation is that the responses involve changes in [Cl−]i and take time to recover. Changes in [Cl−]i are particularly likely because of the surface to volume ratio of the axon domain, but testing for [Cl−]i redistribution with direct measurements from the axons will await additional study. Induction of GABAAR-activated EPSCs shows long-lasting fatigue. A, Histogram of the frequency of EPSCs recorded after waiting 1.5 min (crosses), 5 min (circles), or 10 min (diamonds) between muscimol applications. The black line represents the application of 10 μm muscimol. B, Peak response recorded in each cell as a function of the three different time intervals. Symbols are the same as in A, and black boxes correspond to the averages. Lines connect data from individual cells. *p < 0.05, paired Student's t test. It is not obvious how GABAAR activation induces activity in parallel fibers, but one possibility is that the agonist that was released from our puffer pipette was not localized to the molecular layer and instead diffused into the granule cell layer. If this was the case, then several scenarios could explain why EPSCs are induced by the GABAAR agonists. The cell bodies of granule cells contain GABAARs (Pirker et al., 2000), and, despite hyperpolarized EGABA with respect to the threshold for voltage-gated Na+ channels (Brickley et al., 1996), it is feasible that prolonged activation of the GABAARs on the cell bodies could induce spiking in granule cells via a biphasic response to GABAAR activation similar to that seen in other cell types (Alger and Nicoll, 1982; Staley et al., 1995; Kaila et al., 1997; Perkins and Wong, 1997; Price and Trussell, 2006). If diffusion of our GABAAR agonists into the granule cell layer induced such a depolarization in the cell bodies of the granule cells, then it could have possibly generated a train of action potentials in granule cell somata and led to the burst of postsynaptic EPSCs we recorded in postsynaptic targets. In fact, Golgi cells, whose cell bodies are also in the granule cell layer, have been shown to increase their synaptic output in response to application of GABA (Kaneda et al., 1995), perhaps attributable to a similar mechanism. To determine whether this or any other scenarios involving the diffusion of the agonist away from the tip of the pipette to the granule cell layer was causing the induction of EPSCs, we designed an experiment in which different locations of the puffer pipette were used to release muscimol. We reasoned that, if we moved the pipette closer to the site of induction of the EPSCs, then the muscimol would have a shorter distance to diffuse and the effect would be stronger and recorded after a shorter delay, whereas moving the pipette away from the site of induction would increase the delay and attenuate the response. Therefore, after inducing the effect in the control position with the puffer pipette next to the patch-clamped interneuron (Fig. 4, left), we used the laminar organization of the cerebellar cortex as a guide to move the pipette to two additional positions. We placed the puffer pipette in a position closer to the granule cells in the Purkinje cell layer (Fig. 4A, middle) as well as in a position the same distance away from the control position on the other side of the patch-clamped interneuron (Fig. 4A, right). A significantly larger response was recorded when the puffer pipette was placed at the control position in the center of the molecular layer (p < 0.05, Student's t test; n = 5) (Fig. 4B,C). The weak response recorded when the pipette was moved away from the control position coincided with a small, slow, outward current in the interneuron. This current occurred after a much longer delay from the beginning of the puffer application than the outward current that was recorded when the puffer pipette was in the control position (Fig. 4C). This delayed outward current is indicative of muscimol diffusion back to the interneuron in the molecular layer and was recorded when the pipette was either moved closer to or farther from the granule cell layer. Therefore, the small delayed EPSC response recorded when the pipette is moved away from the control position probably results from muscimol diffusion away from the tip of the puffer pipette back to the parallel fibers. Together, these data indicate that the site of induction is in the molecular layer and not on the granule cell somata. GABAAR activation occurs in the molecular layer. A, Photographs of the placement of the puffer pipette relative to the interneuron that was recorded. In all three photos, the recording pipette is on the left and the puffer pipette is on the right. The left photo shows the puffer pipette in the control position. In the center photo, the puffer pipette (indicated by the white arrow) is moved away from the Purkinje cells (PC) to the outer molecular layer (ML), and, in the right photo, the puffer pipette (black arrow) is moved toward the Purkinje cells. B, Histograms of the average EPSC frequency recorded from the three positions of the puffer pipette. The biggest response is recorded when the pipette is in the control position (gray circles), and a diminished and delayed response is recorded when the puffer pipette is in the outer molecular layer (white circles) or the Purkinje cell layer (black circles). C, Representative traces of responses recorded when the puffer pipette is in the three different positions. Note that an outward current appears in all three traces but is much reduced and delayed when the puffer pipette is in the outer molecular layer or granule cell layer. This indicates that the agonist is eventually diffusing back to the interneuron from which we are recording, and it is not until this occurs (and the outward current appears) that the EPSC frequency begins to increase. Having determined that activation of GABAARs in the molecular layer induces release of glutamate from parallel fibers, we next performed whole-cell recordings from Purkinje cells to test whether the effect could also be recorded in other cell types targeted by parallel fibers. We found that the fast inward currents also occurred in Purkinje cells (Fig. 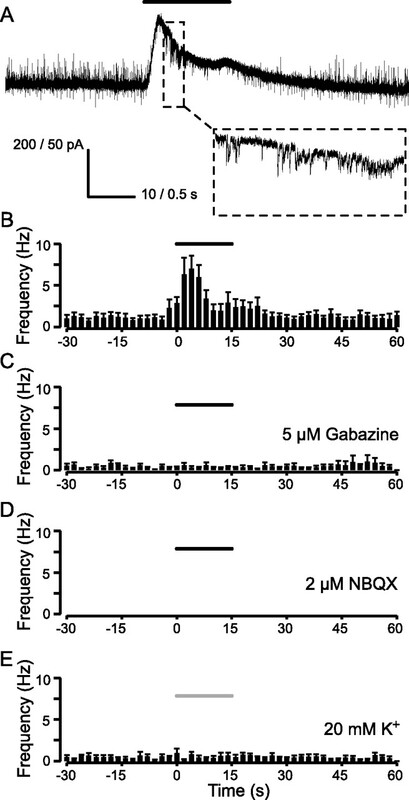 5A,B), and, as in the interneurons, the response was blocked with 5 μm gabazine (n = 4) (Fig. 5C) or 2 μm NBQX (n = 3) (Fig. 5D). Therefore, the response recorded in Purkinje cells can also be attributed to GABAAR-induced activation of AMPA-mediated currents. Along with the results of the experiments in which the position of the puffer pipette was varied, these data indicate that GABAAR activation in the molecular layer leads to release of glutamate from the parallel fibers. GABAAR activation induces EPSCs in Purkinje cells. A, Spontaneous activity recorded in a Purkinje cell held at −60 mV during the application of 10 μm muscimol (black line). The expected reversal potentials for IPSCs and EPSCs are −70 and 0 mV, respectively. The expansion shows the presence of bursts of fast inward currents as recorded in the MLIs. Note that, whereas the frequency of (inward) EPSCs is greatly increased, the (outward) IPSCs are abolished after several seconds of muscimol application, probably attributable to desensitization of GABAARs. B–E, Histograms of the average EPSC frequency recorded during the time period shown in A. B–D, Black bar again signifying the application of muscimol. B, Under control conditions (n = 13 cells). C, In the presence of 5 μm gabazine (n = 4 cells). D, In the presence of 2 μm NBQX (n = 4 cells). E, In control conditions, with the gray bar representing the application of 20 mm K+ instead of muscimol. The possibility remains that the GABAARs are not directly on parallel fibers but instead are on another class of cells in the molecular layer that cause indirect depolarization of parallel fibers. It has been demonstrated that GABAAR stimulation can lead to increased [K+]o of up to ∼8 mm (Barolet and Morris, 1991; Avoli et al., 1996; Kaila et al., 1997). Another explanation for the ability of GABAAR agonists to activate parallel fibers in our study could be that, by applying GABA to the molecular layer, we activated GABAARs on other cells in the vicinity of the parallel fibers (e.g., interneurons, Purkinje cells, or glia) and caused the subsequent release of K+ from these cells, which then depolarized parallel fibers beyond the voltage-gated Na+ channel threshold. To test this hypothesis, we performed experiments in which we recorded from Purkinje cells and induced EPSCs using 10 μm muscimol and then attempted to reproduce the EPSC induction by exchanging the puffer pipette with one containing ACSF supplemented with 20 mm K+. We found that exchanging muscimol for 20 mm K+ produced a small inward current in the Purkinje cell but did not increase the frequency of sEPSCs (n = 4) (Fig. 5E). Therefore, a secondary pathway involving the release of K+ from neighboring cells does not appear to be responsible for the GABAAR-induced EPSCs. Having determined that GABAARs located on parallel fibers are responsible for the muscimol-induced activation of their synapses, we next investigated the localization of GABAARs on these fibers. Using electron microscopy of immunolabeled α1 subunits, we imaged the molecular layer and found that 27% of all asymmetrical synapses had α1 subunits associated with the plasma membrane at either or both the presynaptic (Fig. 6A1–A4) and postsynaptic (Fig. 6B1,B2) sides of the synapse. These asymmetric synapses were considered to be originating from parallel fibers because parallel fibers form >99% of the excitatory, asymmetric synapses in the molecular layer of the cerebellum (Palay and Chan-Palay, 1974; Silver et al., 1998; Foster et al., 2002). The immunogold particles were primarily associated with the active zone, although occasional membrane labeling occurred away from the synapse (Fig. 6B1,B2, crossed arrows). A particle density profile performed orthogonally with respect to the active zone indicated that most labeling occurred within 25 nm of the center of the synaptic cleft (Fig. 6C). This distribution is consistent with a direct association of the antibody to the presynaptic membrane in 74% of the cases and to the postsynaptic membrane in 26% of the cases. Although the presence of postsynaptic GABAARs at glutamatergic synapses in the cerebellum is consistent with a previous study (Nusser et al., 1998), their presence on the presynaptic membrane is a novel finding. A lateral distribution analysis further determined that gold particles were found more often within the synapse than in the extrasynaptic membrane (59 vs 33 particles, respectively, in the presynaptic membrane and 26 vs 17 particles, respectively, in the postsynaptic membrane) (Fig. 6D1,D2). Both for presynaptic and postsynaptic labeling, it is striking that the majority of particles were close to the edge of the synaptic densities. 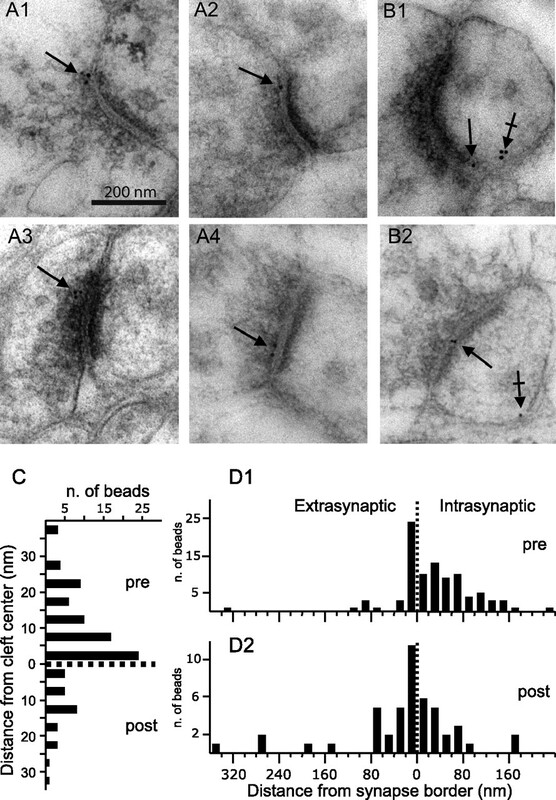 One possibility for this finding is that lateral diffusion of receptors on the cell membrane (Triller and Choquet, 2005) may be slower at the presynaptic terminals and at the postsynaptic density than in the extrasynaptic membrane, and this could underlie the enrichment of α1 subunits in these areas. Incomplete preservation of morphology after preparation of the tissue for EM precluded reliable identification of parallel fiber axons, but it is certainly possible that receptors exist on the axon as well. Altogether, these results indicate that α1 subunits are targeted to the presynaptic side of parallel fiber synapses, and they support the hypothesis that functional GABAARs underlie the muscimol-induced depolarization of these synapses. Localization of α1 GABAAR subunit. A1–A4, Examples of gold particles (arrows) associated with the presynaptic element at the border of the presynaptic active zone (A1, A2) or within the presynaptic active zone (A3, A4). B1, B2, Examples of gold particles associated with the postsynaptic differentiation (arrows) or with the extrasynaptic membrane (crossed arrows). C, Histogram of the distances of particles (100 particles from 82 boutons) from the cleft center (0, dotted line). Note that immunolabeling predominates on the presynaptic side. D1, D2, Histograms of the distances from the synaptic border of the gold particles observed in the presynaptic (D1) and the postsynaptic element (D2). Distances were measured from the nearest border of the synapse (0, dotted line). The left portion of the graph indicates the distance outside of the synapse (extrasynaptic), and the portion on the right indicates distance within the synapse (intrasynaptic). If GABAARs cause depolarization of the presynaptic terminal, then it would be predicted that transmission at parallel fiber synapses should be increased when the receptors are activated (Awatramani et al., 2005). To test whether transmission is affected, we evoked EPSCs in Purkinje cells by stimulating parallel fibers and compared EPSCs evoked in control conditions with EPSCs evoked in the presence of muscimol. To achieve this, EPSCs were evoked in coronal slices under control conditions by placing an extracellular stimulating electrode in the molecular layer ∼300 μm from the patch-clamped Purkinje cell. A puffer pipette was placed in the parallel fibers approximately half way between the stimulation electrode and the patch-clamped Purkinje cell, and 10 μm muscimol was puffed after baseline EPSCs were recorded for 30 s. Figure 7A shows that the amplitudes of the resulting EPSCs recorded in Purkinje cells were increased during application of muscimol and returned to control amplitudes after muscimol was washed away. Muscimol increased evoked EPSC amplitudes by 42.1 ± 6.6% (Fig. 7A,B), and the effect was completely blocked by 5 μm gabazine (data not shown). These results indicate that muscimol application increased the amplitude of parallel fiber EPSCs by activating presynaptic GABAARs. GABAAR activation increases the amplitude of EPSCs evoked in Purkinje cells. A, Time course of evoked EPSC amplitudes normalized to the average amplitude recorded in each cell during the 30 s before the application of 10 μm muscimol (black bar). EPSCs were recorded in Purkinje cells and were evoked by giving an extracellular stimulus to the parallel fibers every second. 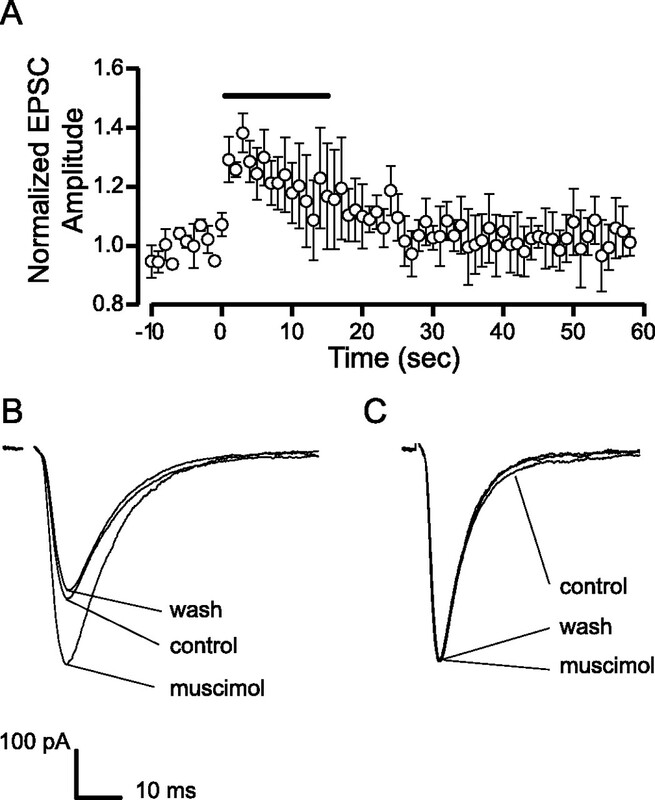 B, Representative traces of average EPSCs evoked in control conditions, in the presence of muscimol, and after muscimol was washed from the bath. C, Traces from B normalized to show no change in the voltage clamp during or after muscimol application. The experiments above demonstrate that activation of the presynaptic receptors with exogenously applied GABA agonists potentiate parallel fiber transmission, but the concentrations and time course we used for the application of the agonist in those experiments are obviously different from those that the receptors would encounter in normal cerebellar function. We therefore wanted to determine whether activation of the receptors by GABA released from neurons has the same effect on parallel fiber transmission. Previously, Dittman and Regehr (1997) demonstrated that GABABRs on parallel fibers can be activated by GABA released from nearby interneurons. By recording evoked EPSCs in Purkinje cells using a stimulation paradigm identical to the one used in their study but using a GABABR antagonist (see Materials and Methods) (Fig. 8A), we show that the GABA released from interneuron activity also activates GABAARs. In Figure 8B, we show that EPSCs evoked 100 ms after a train of 10 stimuli at 100 Hz is given to the parallel fibers have amplitudes that are 14 ± 4% greater than EPSCs that are evoked before the train (n = 4; p < 0.05, paired Student's t test) (Fig. 8D). However, washing 5 μm gabazine onto the slice abolished the difference in amplitudes of the events evoked before and after the train (Fig. 8C,D). This effect is attributable to the sequential activation by the stimulus train of parallel fibers and their postsynaptic MLIs. The GABA released by the MLIs activates the GABAARs on the presynaptic parallel fibers and facilitates the EPSC recorded postsynaptically. However, when the presynaptic receptors are blocked by 5 μm gabazine, the GABA released by the interneurons has no effect and the postsynaptically recorded EPSC is unchanged by the stimulus train. These experiments demonstrate that activation of presynaptic GABAARs by GABA released from nearby MLIs induces a facilitation of parallel fiber transmission similar to that recorded when receptors are activated with exogenously applied agonists. Interneuron activity increases the amplitude of EPSCs evoked in Purkinje cells. A, Illustration of a stimulus paradigm in which two individual sets of parallel fibers were stimulated using two separate stimulation electrodes to separate the fibers that were activated by two test stimuli (stim i and stim ii) from the fibers that were activated by a train of 10 stimuli at 100 Hz (see Materials and Methods). stim i was timed to produce an EPSC in the postsynaptic Purkinje cell 5 s before the train of stimuli given to nearby parallel fibers, and then stim ii was delivered 100 ms after the termination of the train. The entire sequence was repeated every 30 s for 10 min before 5 μm gabazine was washed onto the slice. B, Sample traces of averaged EPSCs from the control period before gabazine was perfused. The average EPSC produced from stim ii (right, solid line) has an increased amplitude compared with the average EPSC produced by stim i (left and right, dotted line). C, Sample traces of the average EPSCs recorded after gabazine had been perfused for 5 min onto the same cell as in B. The average EPSC produced from stim ii (right, solid line) is now identical to the average EPSC produced by stim i (dotted line, left and right). D, Group data from four cells showing that perfusion of gabazine onto the slice systematically abolishes the increase in EPSC amplitude caused by the train of stimuli given to nearby parallel fibers. Note the absence of any facilitation in gabazine indicating that the parallel fibers stimulated with the train are indeed distinct from the parallel fibers stimulated by the two test stimuli. All recordings were made in the presence of a blocker of GABABRs (2 μm CGP 55845). Our results show that activation of GABAARs in the cerebellar molecular layer causes transmitter to be released from glutamatergic synapses onto Purkinje cells and MLIs. Several lines of evidence indicate that the GABAARs responsible for activating these synapses are located on parallel fibers. (1) Activation of GABAARs induces EPSCs in both Purkinje cells and MLIs, which are both innervated by parallel fibers. (2) In MLIs, the size and time course of the EPSCs that are induced by GABAAR activation are the same as those occurring at rest [these events are classically considered to reflect random quantal release from parallel fibers (Carter and Regehr, 2002)]. (3) That the EPSCs arise from climbing fiber terminals seems highly unlikely because of the rapid kinetics of the GABA-evoked EPSCs we recorded in MLIs (Jorntell and Ekerot, 2003; Szapiro and Barbour, 2007), and the features of the response in Purkinje cells (a flurry of fast, quantal events) is incompatible with previous reports of EPSCs originating from climbing fibers. (4) Our EM micrographs show α1-containing GABAARs on parallel fiber terminals. (5) We demonstrate that the GABAARs responsible for the effect are only located in the molecular layer (activation of GABAARs outside of the molecular layer does not produce the response) (Fig. 4). (6) A secondary mechanism involving K+ released from others cells in the molecular layer (via a GABA-mediated depolarizing nonsynaptic potential) (Voipio and Kaila, 2000) can be ruled out because circumventing activation of GABAARs and directly applying K+ to the parallel fibers does not reproduce the response. Together, these points indicate that GABAARs are present on the terminals of parallel fibers and that opening the receptors activates parallel fiber synapses. Our results also give several important clues about the presynaptic mechanism by which agonist application to the receptors activates parallel fiber synapses. One step in the process involves voltage-gated Na+ channels, as is evidenced by the inability to record GABA-induced EPSCs in the presence of TTX. This indicates that Na+ channel activation is a necessary component of the mechanism, but, when we made cell-attached recordings from granule cell bodies, we did not record action potentials resulting from application of GABAAR agonists to the molecular layer (data not shown). One possible explanation for this result is that GABAARs are only expressed on a subset of parallel fibers and that we were unable to locate the particular subset of cell bodies that correspond to those fibers. This is, however, unlikely because many such trials have been made in both coronal and sagittal slice preparations. Another more likely explanation is that, if action potentials are generated in the parallel fiber axons or terminals, they do not propagate back to the cell body. The lack of action potential propagation in the presence of GABAAR agonists could be attributable to a shunting effect of GABAAR-induced currents that prevents the current carried by a local action potential to passively depolarize the axonal membrane at the next potential site of propagation (Segev, 1990). More insight into the mechanism comes from the observation that EPSCs recorded postsynaptically usually occur in short bursts lasting several hundreds of milliseconds, with between two to five EPSCs in each burst. These bursts can be explained by either coordinated release from several presynaptic parallel fibers or rapid repetitive firing of a single fiber. It is unlikely that the precision of EPSC coordination within bursts results from several fibers firing at almost the same time because the bursts occur randomly during the first few seconds of agonist application. The mechanism of GABA-induced activation of parallel fibers that begins to emerge from the results is the following: activation of GABAARs on parallel fibers depolarizes the membrane, either because EGABA is more depolarized than the membrane potential or because EGABA is hyperpolarized, but continued Cl− accumulation collapses the Cl− gradient and induces a biphasic GABA response (Staley et al., 1995). We favor the explanation of depolarized EGABA because the depolarization from exogenously applied agonists occurs almost instantaneously, because synaptically released GABA also causes the depolarization (Fig. 8B), and because recent studies have shown higher Cl− concentrations in axons than in somata (Price and Trussell, 2006; Szabadics et al., 2006). Our results recorded in the absence of TTX indicate that the depolarization is sufficient to cross the threshold for voltage-dependant Na+ channels, but our experiments in the presence of TTX indicate that they do not depolarize beyond the threshold of synaptic Ca2+ channels. This is not unexpected because Ca2+ channels at parallel fiber to Purkinje cell synapses are composed of various high-voltage-activated Ca2+ channels (Mintz et al., 1995) and open at more depolarized values than Na+ channels (Nowycky et al., 1985; Fox et al., 1987; Usowicz et al., 1992; Hille, 2001). 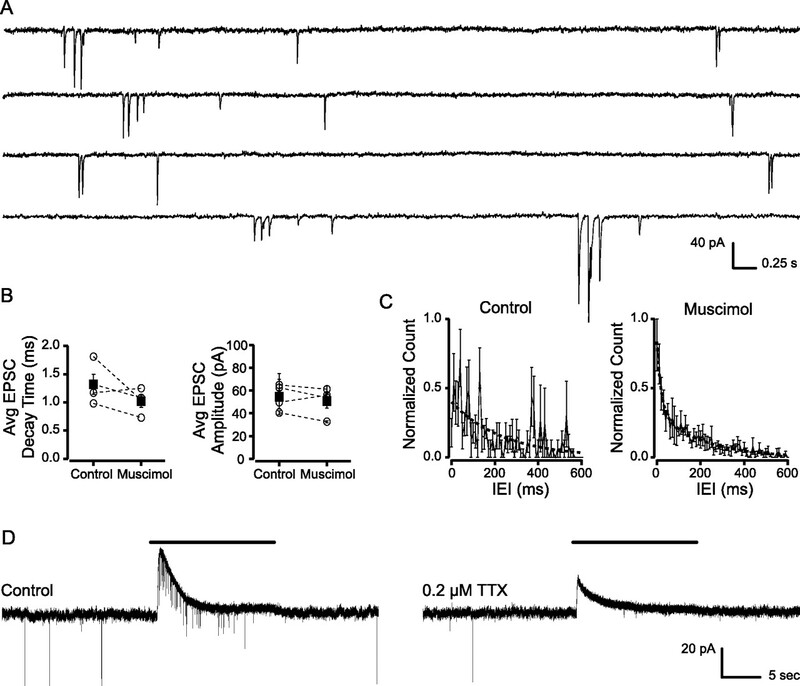 Therefore, Na+ channel activation is necessary for the activation of these Ca2+ channels and is the likely explanation for why the GABAA-induced EPSCs are TTX sensitive. A positive feedback system in which parallel fiber activation of interneurons results in increased excitability of parallel fibers could be a mechanism to ensure that information coming into the granule cells from mossy fibers is reliably relayed and processed in Purkinje cells. The mechanism described here predicts that bursts of activity in granule cells, as is recorded in response to sensory stimuli in vivo (Chadderton et al., 2004; Jorntell and Ekerot, 2006), will activate postsynaptic MLIs, which will increase the activation of presynaptic GABAARs and thereby the efficacy of the later portion of the burst. Therefore, the positive feedback is likely to be a mechanism to ensure that bursts of activity in granule cells is highly distinguishable from random spiking, and modulation of these presynaptic receptors could play a crucial role in affecting the salience of the bursts and cerebellar physiology. We thank David DiGregorio and Tom Otis for many helpful discussions throughout the project and for comments on this manuscript, the Centre National pour la Recherche Scientifique, Agence Nationale pour la Recherche, Fondation pour la Recherche Médicale, and French Ministry for Research for supporting our research, and Prof. Werner Sieghart for providing the α1 GABAA receptor antibody used in this work. We also like to thank Isabelle Galzin for help with preparing the figures. (2006) Combined analog and action potential coding in hippocampal mossy fibers. Science 311:1290–1293. (2007) GABAergic spill-over transmission onto hippocampal mossy fiber boutons. J Neurosci 27:942–950. (2000) Quantal currents at single-site central synapses. J Physiol (Lond) 526:3–11. (1996) Extracellular free potassium and calcium during synchronous activity induced by 4-aminopyridine in the juvenile rat hippocampus. J Physiol (Lond) 493:707–717. (2005) Modulation of transmitter release by presynaptic resting potential and background calcium levels. Neuron 48:109–121. (1991) Changes in extracellular K+ evoked by GABA, THIP and baclofen in the guinea-pig hippocampal slice. Exp Brain Res 84:591–598. (1996) Development of a tonic form of synaptic inhibition in rat cerebellar granule cells resulting from persistent activation of GABAA receptors. J Physiol (Lond) 497:753–759. (2002) Quantal events shape cerebellar interneuron firing. Nat Neurosci 5:1309–1318. (2004) Integration of quanta in cerebellar granule cells during sensory processing. Nature 428:856–860. (2003) Coexistence of excitatory and inhibitory GABA synapses in the cerebellar interneuron network. J Neurosci 23:2019–2031. (1997) Mechanism and kinetics of heterosynaptic depression at a cerebellar synapse. J Neurosci 17:9048–9059. (2005) Variations on an inhibitory theme: phasic and tonic activation of GABA(A) receptors. Nat Rev Neurosci 6:215–229. (1997) Loose-patch recordings of single quanta at individual hippocampal synapses. Nature 388:874–878. (2002) Interaction of postsynaptic receptor saturation with presynaptic mechanisms produces a reliable synapse. Neuron 36:1115–1126. (1987) Single-channel recordings of three types of calcium channels in chick sensory neurones. J Physiol (Lond) 394:173–200. (2003) Excitatory actions of GABA in the cortex. Neuron 37:299–309. (2001) Ion channels of excitable membranes (Sinauer, Sunderland, MA), Ed 3. (2006) Presynaptic GABAA receptors facilitate spontaneous glutamate release from presynaptic terminals on mechanically dissociated rat CA3 pyramidal neurons. Neuroscience 138:25–35. (1995) Desensitized states prolong GABAA channel responses to brief agonist pulses. Neuron 15:181–191. (2003) Receptive field plasticity profoundly alters the cutaneous parallel fiber synaptic input to cerebellar interneurons in vivo. J Neurosci 23:9620–9631. 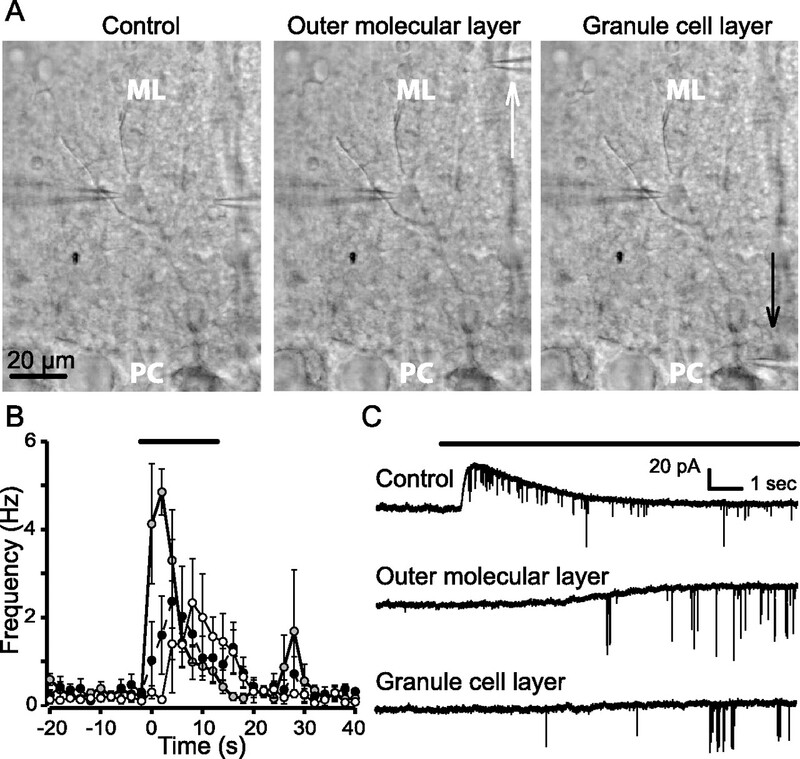 (2006) Properties of somatosensory synaptic integration in cerebellar granule cells in vivo. J Neurosci 26:11786–11797. (1995) Whole-cell and single-channel currents activated by GABA and glycine in granule cells of the rat cerebellum. J Physiol (Lond) 485:419–435. (2005) Presynaptic, extrasynaptic and axonal GABAA receptors in the CNS: where and why? Prog Biophys Mol Biol 87:33–46. (1993) Inhibitory synaptic currents in stellate cells of rat cerebellar slices. J Physiol (Lond) 468:177–200. (1995) Calcium control of transmitter release at a cerebellar synapse. Neuron 15:675–688. (2007) GABAergic interneurons facilitate mossy fiber excitability in the developing hippocampus. J Neurosci 27:1365–1373. (1985) Three types of neuronal calcium channel with different calcium agonist sensitivity. Nature 316:440–443. (1995) Immunocytochemical localization of the alpha 1 and beta 2/3 subunits of the GABAA receptor in relation to specific GABAergic synapses in the dentate gyrus. Eur J Neurosci 7:630–646. (1998) Segregation of different GABAA receptors to synaptic and extrasynaptic membranes of cerebellar granule cells. J Neurosci 18:1693–1703. (1997) The depolarizing GABA response. Can J Physiol Pharmacol 75:516–519. (2000) GABA(A) receptors: immunocytochemical distribution of 13 subunits in the adult rat brain. Neuroscience 101:815–850. (1999) Somatic recording of GABAergic autoreceptor current in cerebellar stellate and basket cells. J Neurosci 19:1675–1690. (2006) Estimate of the chloride concentration in a central glutamatergic terminal: a gramicidin perforated-patch study on the calyx of Held. J Neurosci 26:11432–11436. (2003) GABAA receptors at hippocampal mossy fibers. Neuron 39:961–973. (1993) GABA induces a unique rise of [Ca]i in cultured rat hippocampal neurons. Hippocampus 3:229–238. (1990) Computer study of presynaptic inhibition controlling the spread of action potentials into axonal terminals. J Neurophysiol 63:987–998. (2006) Modulation of intracortical synaptic potentials by presynaptic somatic membrane potential. Nature 441:761–765. (1998) Locus of frequency-dependent depression identified with multiple-probability fluctuation analysis at rat climbing fibre-Purkinje cell synapses. J Physiol (Lond) 510:881–902. (2006) Excitatory effect of GABAergic axo-axonic cells in cortical microcircuits. Science 311:233–235. (2007) Multiple climbing fibers signal to molecular layer interneurons exclusively via glutamate spillover. Nat Neurosci 10:735–742. (2002) Reciprocal developmental regulation of presynaptic ionotropic receptors. Proc Natl Acad Sci USA 99:13884–13889. (1992) P-type calcium channels in the somata and dendrites of adult cerebellar Purkinje cells. Neuron 9:1185–1199. (2000) GABAergic excitation and K+-mediated volume transmission in the hippocampus. Prog Brain Res 125:329–338. (1991) Separation of alpha 1, alpha 2 and alpha 3 subunits of the GABAA-benzodiazepine receptor complex by immunoaffinity chromatography. Brain Res 563:325–328. (1993) GABA-activated chloride channels in secretory nerve endings. Science 259:531–534.